Good morning everyone!! 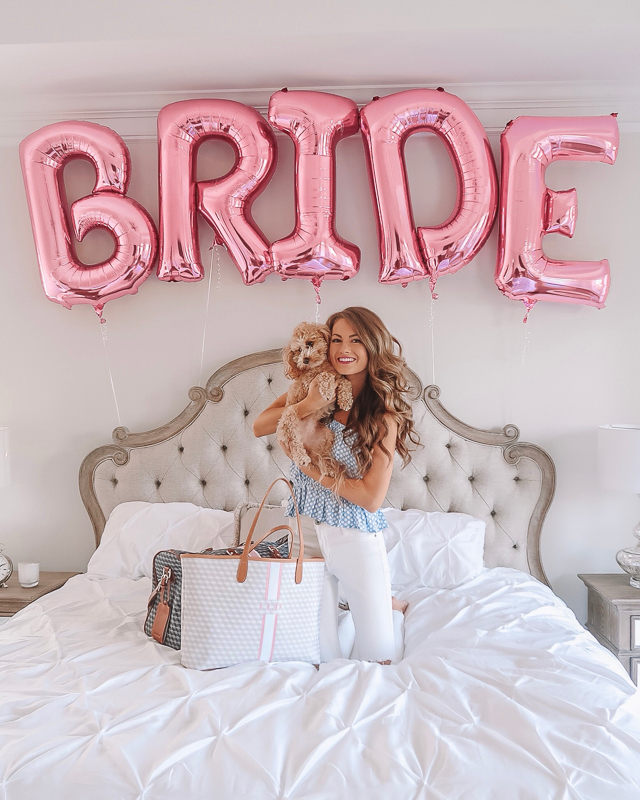 Today I’m so happy to be sharing the details of my bachelorette weekend!!! What I really wanted for the entire weekend was to be able to get some sun on the beach, relax and enjoy being surrounded by all my best friends, and that’s exactly what happened 🙂 My matron of honor found an amazing rental house in Wild Dunes, SC – our house was pretty much right on the beach, within walking distance to the Boardwalk Inn (where you can get food and drinks) and only a 20 minute drive from downtown Charleston. I would highly recommend Wild Dunes – plus, it’s a gated community so it’s VERY safe, not to mention clean and beautiful! Friday morning, my friends Sara and Brit met me at my house at 9 a.m. (the photo above was taken RIGHT before we hopped in the car!) and we headed to Charlotte to pick up our friend Emily, then to my cousin Jennifer’s house. Jennifer has a HUUUUUGE car, which was great because it fit all of our luggage and wine bottles (hehe)! We tried really hard to pack as little as we could, but of course we all had multiple bags hahah! 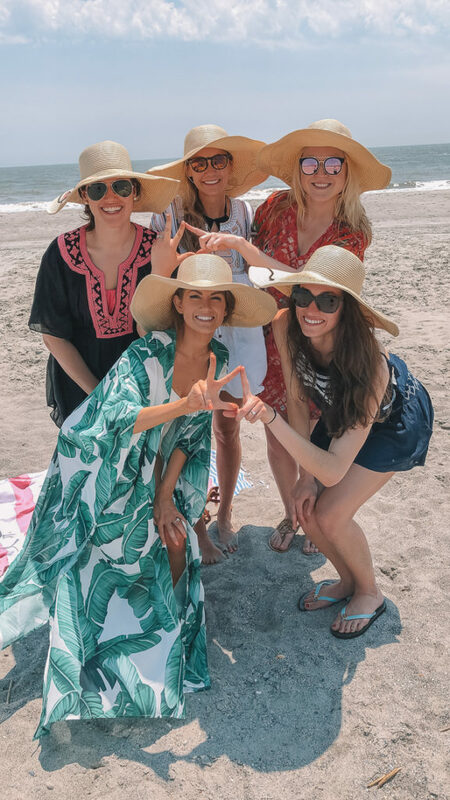 My two matrons of honor Anna and Melissa arrived to the house in Charleston right at the same time as us, so we all quickly changed into our bathing suits and headed to the beach. I swear, the beach is my happy place, and I instantly feel at peace whenever I’m next to the ocean. 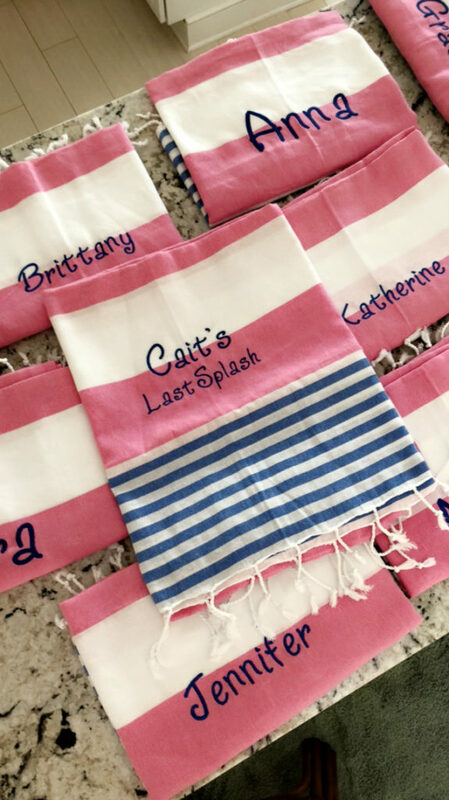 We all laid our beach towels in a circle and played a couple rounds of “Never Have I Ever.” Then we headed back up to the house to meet some of the other girls that were just arriving! A few of us went to the grocery store to pick up some snacks and water bottles, while the rest of the girls stayed home to start fixing dinner. When we got back, the girls had all decorated the house! The next item on the agenda was the Lingerie Shower! 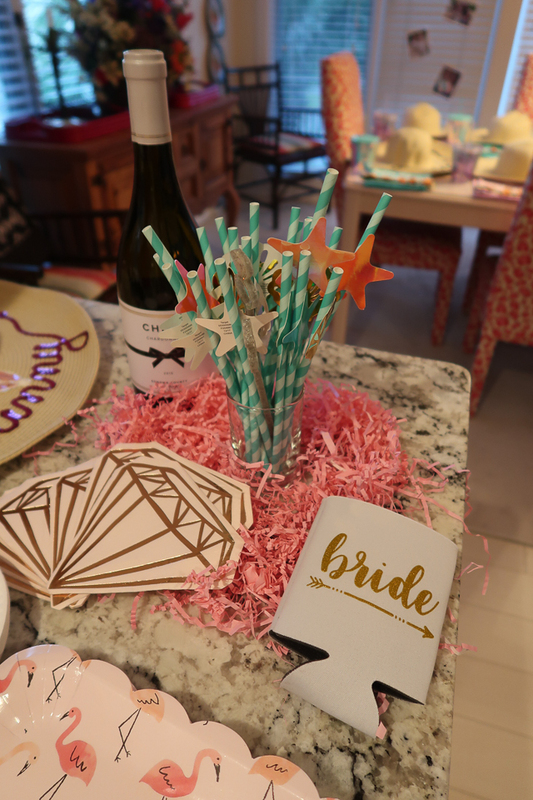 If you haven’t heard of a Lingerie Shower, I’m pretty sure it’s a southern thing! (Although I could be wrong on that). Basically, all of the girls gifted me pretty lingerie to wear on the honeymoon. I took turns opening each gift and then had to guess who it was from. It was so fun but also a bit embarrassing 🙂 The rest of the night we spent all hanging out, laughing and eating the rest of the peanut butter cookie dough dip, haha. On Saturday morning, we all had breakfast (a bunch of the girls had volunteered to bring breakfast so we had pancakes, avocado toast and bagels along with coffee), then put on our swimsuits for a beach day. I wore an old white swimsuit from ASOS, but this one is incredibly similar and only $30! For lunch, we walked on the beach to the Boardwalk Inn and ate at their little beach restaurant. They have a selection of sandwiches, burgers, salads and wraps – and their tater tots are delicious! Around 4 p.m. we all headed back to the house to take showers and get ready for dinner that night. 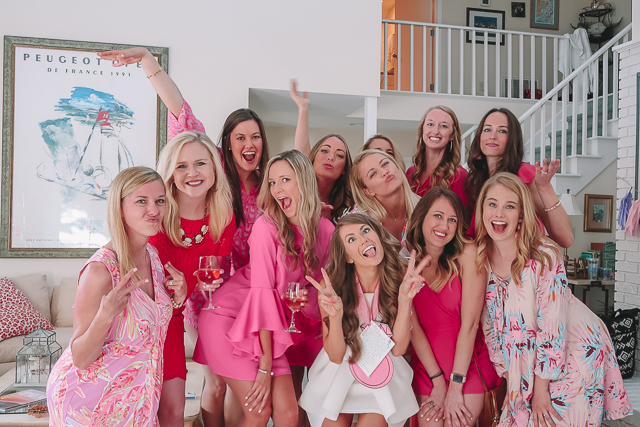 I wore an old white dress I have from Revolve, and all of my girls dressed in pink! Anna putting on my veil! 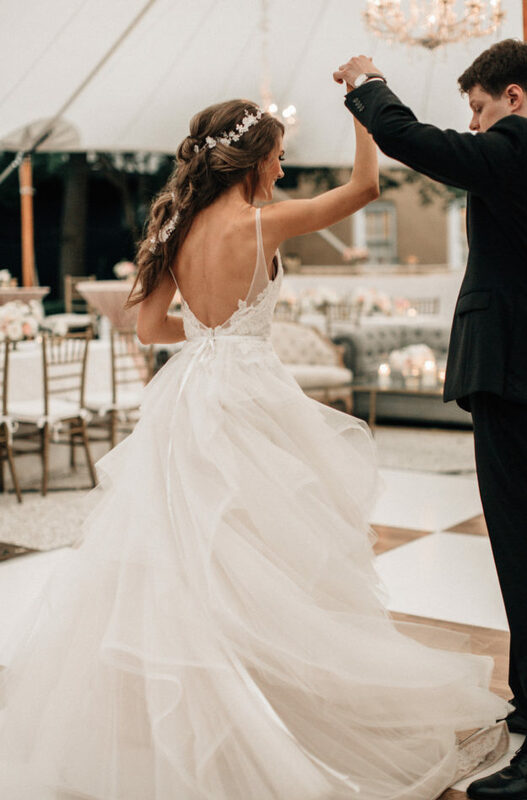 My dress is a few years old from Revolve (you may remember it from this blog post back in the day), but I did find similar ones here and here. My shoes are here. 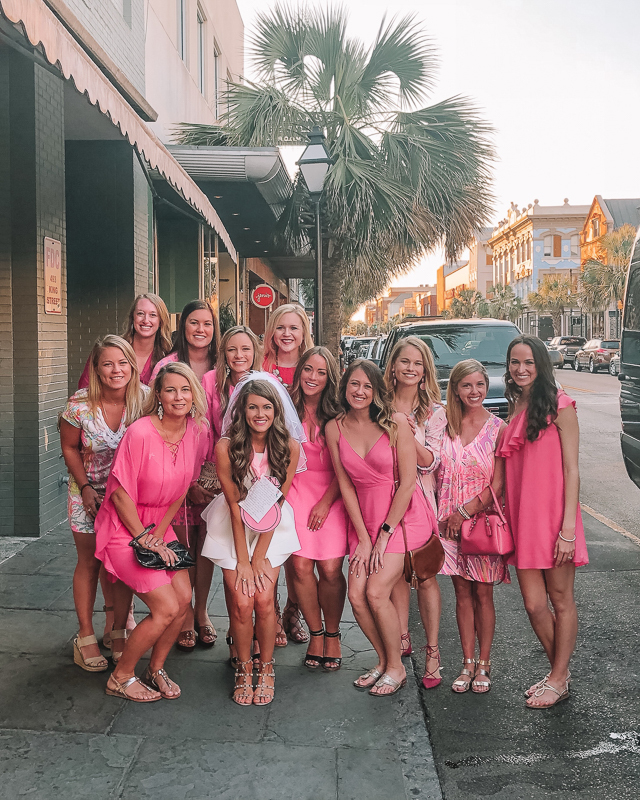 That night, we all took a party bus to downtown Charleston (which I would highly recommend because Ubers are hard to come by in Wild Dunes!). Our first stop of the night was Stars Restaurant for its rooftop bar. After Stars, we walked to Eli’s Table, my absolute FAVVVVVVORITE restaurant in Charleston! Anna had made us a reservation several months in advance (they fill up really fast!). They have a large patio out back that is really cute, but it was really hot outside so we ended up sitting inside in the air conditioning! We had several appetizers (the smoked gouda fondue is amazing) and for dinner I had the local fish, grouper, while a bunch of the girls ordered the shrimp and grits (a Charleston specialty). It was delish!! After dinner, we all headed to a nearby bar to DANCE! 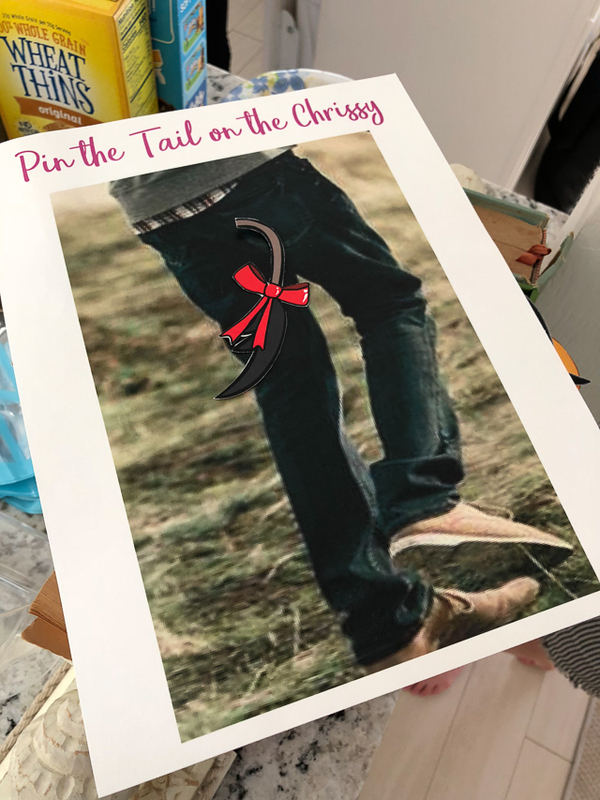 Anna had printed out a “Bachelorette Scavenger Hunt” which she hung around my neck with ribbon. The entire night, I had to do things to check off the list, which made the whole night really fun! For instance, I had to stand on a table and yell “I’m getting married! !” (which I did after a glass of wine haha). I also had to find another bride on her bachelorette party and take a picture with her, and find a guy with the same name as the groom (Chris) and take a picture with him. After a fun (late) night out, we all headed home – a bunch of the girls stayed up talking late into the night, and then we crashed! The next morning we all ate breakfast, packed, cleaned the house and then headed home. 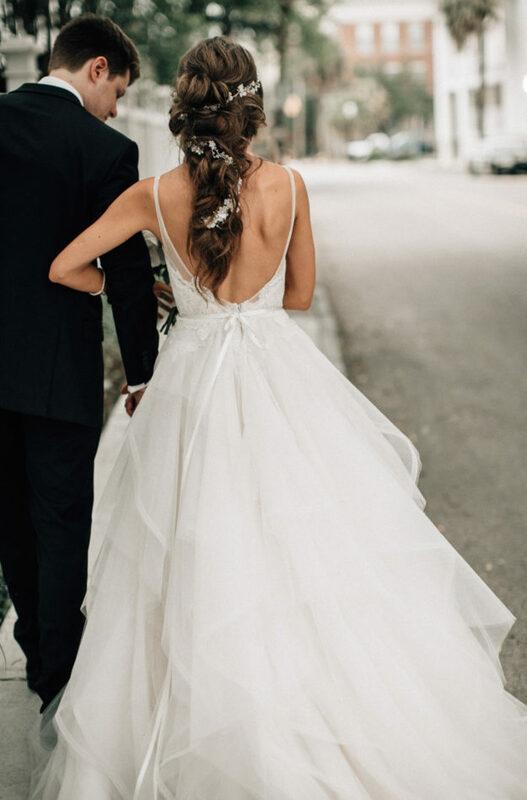 It was honestly one of the best weekends of my entire life (it will be second-best after the wedding!) and I am so thankful to be surrounded by such positive, loving and KIND friends. Even though a bunch of the girls didn’t know each other beforehand, everyone got along so well and (I hope) had a much fun as I did. My abs were so sore at the end of the weekend from laughing so much. A huge thank you to my matrons of honor for planning everything and doing such an amazing job!!!! Aww it looks like y'all had a blast!! 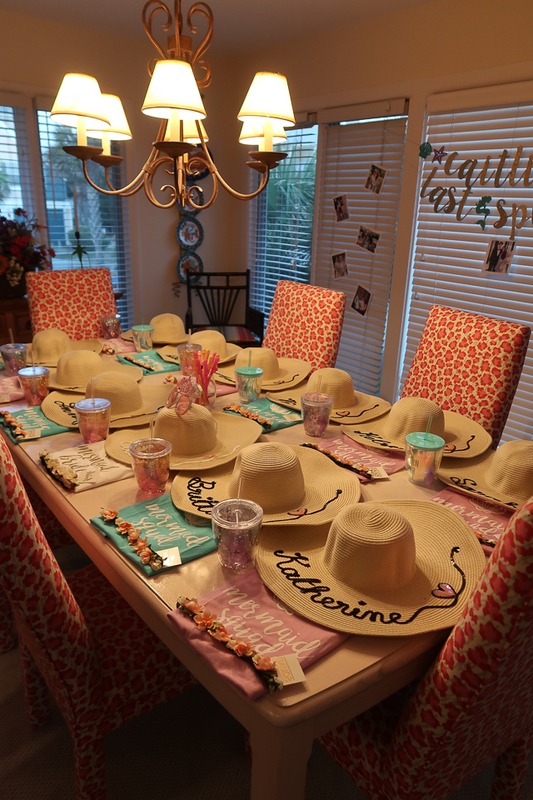 The decorations turned out so so cute- looks like the perfect weekend at the beach! Omg such a wonderful time! Thank you for sharing. You gals look like you know how to have a fun time. Congrats again!! What fun!! 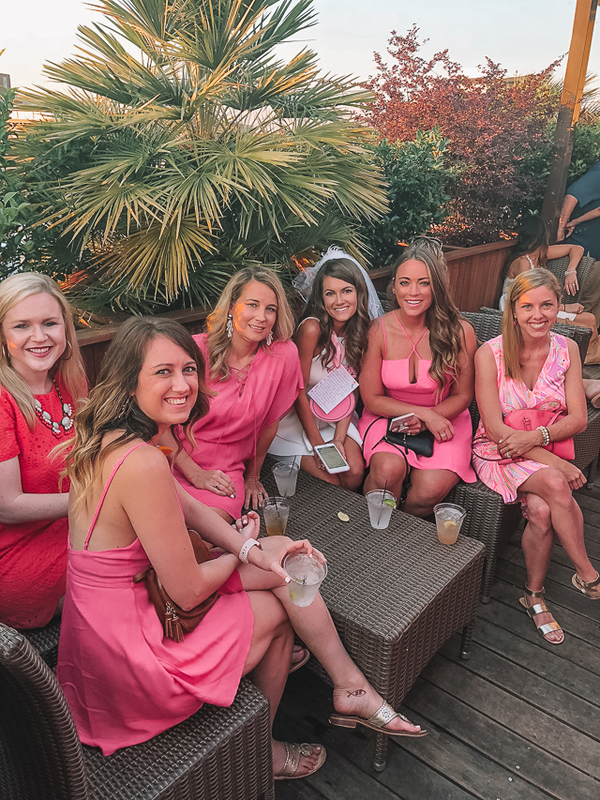 Looks and sounds like you ladies had a blast! Sounds like a really fun weekend! 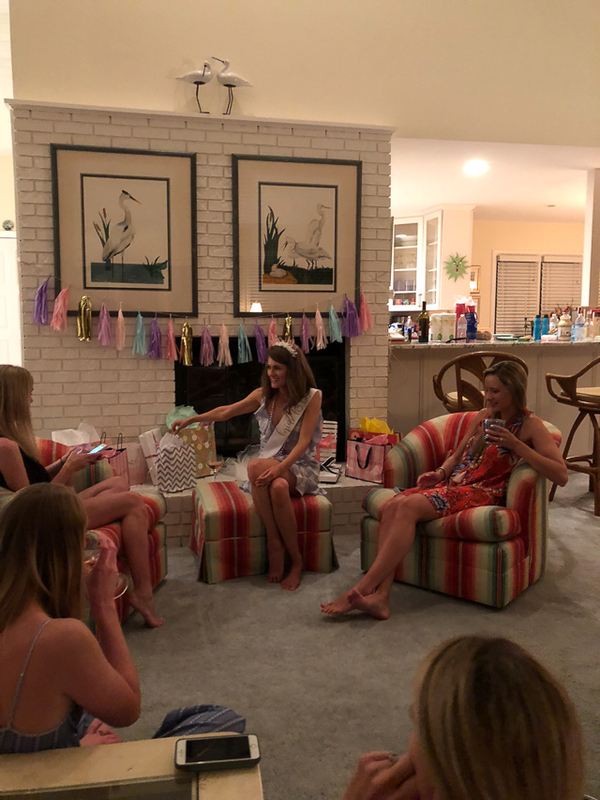 We did a lingerie shower for my sister, and then my girls did one for me – so it's making its way up to the North! (We're in Boston) Enjoy this time – so many great things to come! This seems like so much fun Caitlin! Is there anything you wish you could've done differently or if you had more time? 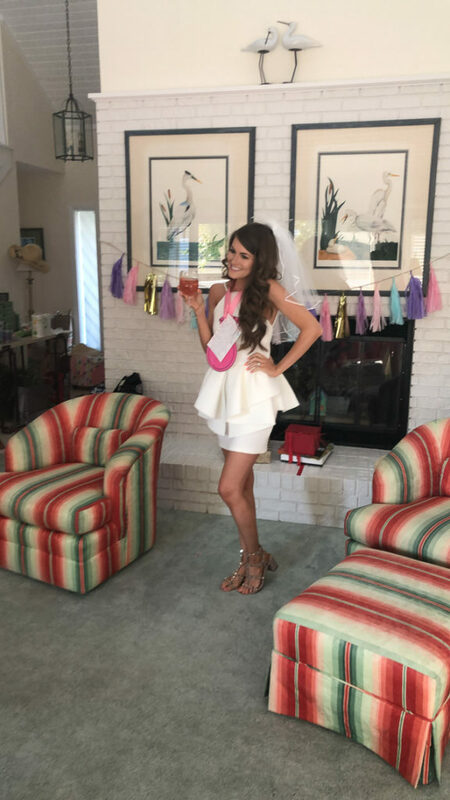 Your backelorette party sounds so much fun and it looked great over on Instagram stories Cait! How wonderful this looks! I love the less professional looking photos too because we really get to see you guys in the moment! I know your wedding is going to be spectacular and I'm wishing you all the best. Your joy and excitement shines through bright and radiant! I hope you’ll be doing a book review soon and/or another pod cast review. Dying for some good summer reads! Looks and sounds like you had a blast. It looked so much fun! So glad you shared pics! 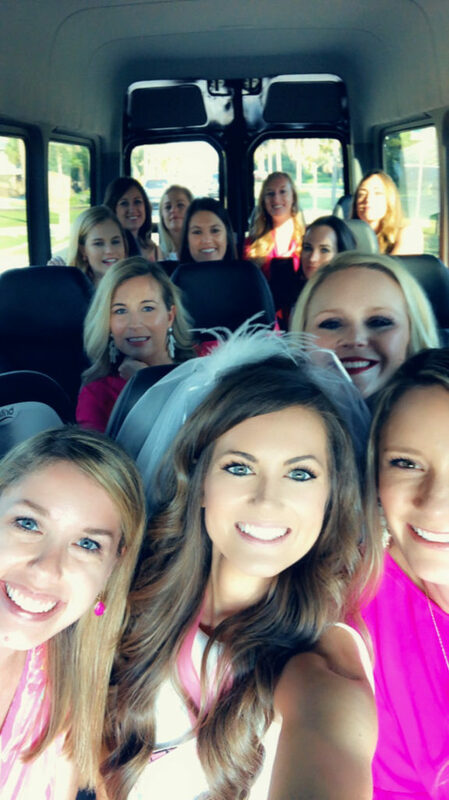 Your Bachelorette party looks so cute! 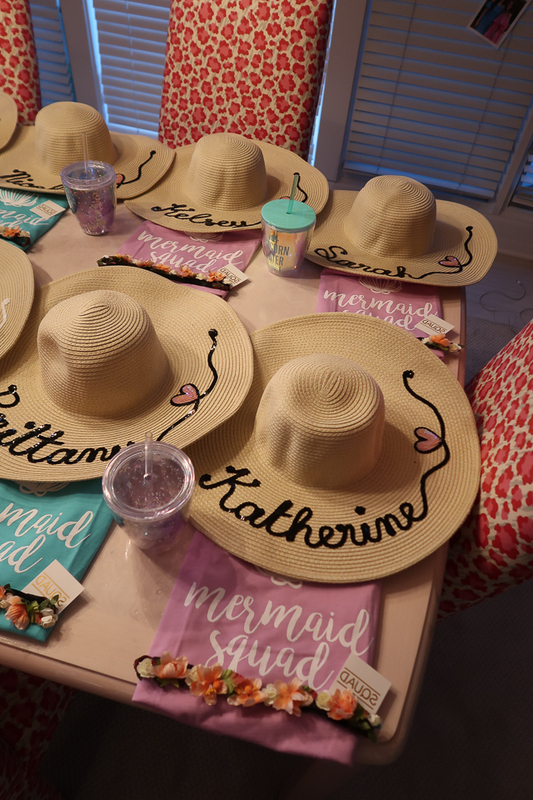 I love those beach hats, such a fun favor (and photo op haha! ).